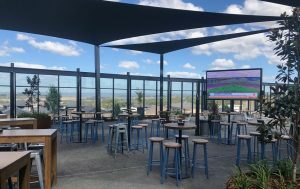 New top of the range facilities are transforming Country Club Gledswood Hills into the social and interactive destination of Macarthur. The work includes a sophisticated courtyard with great views, communal dining area with private booths, a Game-Play Hill for kids of all ages and the addition of a wood fire pizzeria to the dining options for members and guests. The Courtyard, pictured, is the perfect place to take in the sunset with views over Camden Valley. Fitted with timber, concrete, and native Australian greenery, the terrace will be a place to enjoy a sophisticated drink with friends and family. It will boast fresh timber panelling, roof slats, comfy stools, ample lighting, air conditioning and heating, combined with dedicated service attendants. A huge 4.5m x 2.5m LED screen has been installed in the courtyard, so come on down and watch sport like you have never watched it before. Catering to the growth of new families in the Camden area, Country Club Gledswood Hills is constructing a sophisticated communal dining area with private booths, lounge areas, screens and comfortable furniture pieces. The new and exciting Game-Play Hill will cater to kids of all ages. Work is well under way and is due to be completed early 2019. 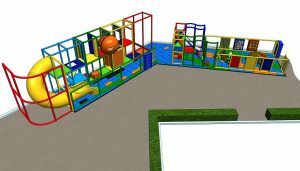 There will be a selection of soft play and hard play options with a parent dining area in close proximity. This dedicated kids’ zone will also feature a number of arcade games with frequent school holiday and weekend entertainment on offer. Parents can make the most of some peace and quiet while the kids are entertained close by. Wests Group Macarthur CEO Tony Mathew believes that catering to families and young children is crucial for venues in this young and ever growing community. “We must offer an array of family friendly facilities to ensure that we are catering to the demographics of our local area,’’ he said. 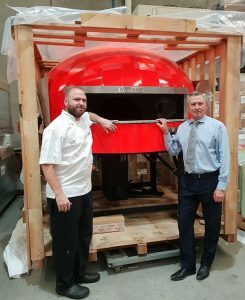 Luke Risby, Head Chef of Country Club Gledswood Hills with Wests Group Macarthur CEO Tony Mathew during delivery of the giant wood fired pizza oven. On the dining side, the Country Club will continue to offer the renowned Country Club Signature meals, brasserie type menu items using local and regional fresh suppliers, slow cooked meats, ribs and sides from the Radar BBQ Smoker. But it is also introducing a wood fired pizzeria using a massive Italian Marana Forni Woodfire Pizza oven. Best known for its craftsmanship and design and amazing cooking capabilities, Country Club will be able to deliver a healthier and tastier pizza to members and guests. The Marana Forni oven is capable of cooking temperatures of up to 700 degrees, which means pizzas are cooked in less than five minutes. Membership to Country Club Gledswood Hills, from just $8 for one year, comes with an immediate 15 percent discount on all food, beverage and selected entertainment. For more information please visit countryclubgh.com.au/ournew-destination, follow Country Club Gledswood Hills on Facebook or head into the club premises at 91 The Hermitage Way, Gledswood Hills.